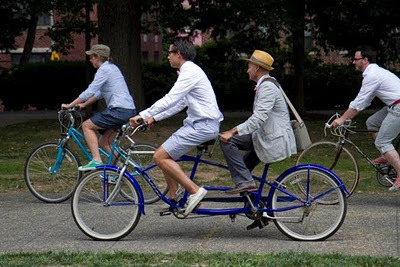 Here's a group in Washington, DC who have certainly understood what Cycle Chic is all about. I dare say they're taking it to their own, new level. The Dandies and Quaintrelles [tagline: Redemption Through Style] organised a Bike Ride & Lawn Party called The Seersucker Social last weekend. Here's a Vimeo film about the event. Beats the hell out of Tweed Rides, in my opinion. Needless to say... Cycle Chic approves. It always brings a smile to the face to see them riding through town. Egads! Lovely. If only we could get stable "seersucker weather" here in Paris, I'd try to look like that riding to the office every day. 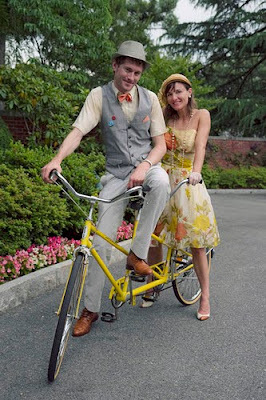 On the topic, the ever insightful retrogrouches at Rivendell Bicycle Works have a nice post about bike clothing that you may like, titled "All you need is wool (plus a little seersucker, sucker)"
Dudes split the difference between cycle chic and American bike culture their own special way. Respect. why do they call it "seersucker", anyway? Klaus, there is no shortage of chic, cycle or otherwise, in Paris, but seersucker is a tropical fabric that is rarely appropriate there. It was adopted by British colonials in torrid colonies and from there, among gentlemen in the US South. It is certainly not common here in Montréal, even in hot summer months. There can be many such subtle differences in what is elegant and chic, depending on the climate, culture, architecture and history of cities and countries. For example, I couldn't buy some garments I bought in Rome here because the colours were wrong. There is a lot of burnt orange in Roman buildings, which I found oppressive at first but warmed to. Washington DC is at the upper edge of the "Old South", chosen as a North-South compromise, but it was built on a swamp so in the summer months its climate is extremely hot and muggy. And there's a video now! There is another video here. I just love your explanation.